A simple warming coconut flour porridge for quiet mornings. 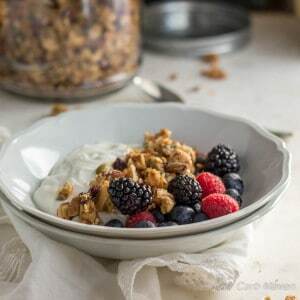 This low carb breakfast cereal comes together in minutes providing a fast keto, grain-free breakfast option. It’s New Years morning and while much of the world is sleeping-in after last night’s festivities, I am awake and contemplative. It’s been a while since I’ve had time to reflect on my life, my family and what I want. For many years school work was a priority, then marriage and work. Soon, readying a home for a baby took precedence and my quiet days tumbled into one another; an endless cycle of sleep deprivation, feedings, bottles and dishes, diapers, smiles and tiny clothes. The kids are growing and both attend school during the week. I am alone in the house again – enjoying the solitude and the company of my own thoughts. The blog keeps me busy. There’s shopping, cooking, taking photographs and writing posts until the children come home in a flurry of excited tales about who did what at school and what’s for snack, followed by homework and then dinner. Life moves so quickly sometimes I forget to breath. But currently it’s quiet in the house and I have this simple bowl of coconut flour porridge – and time to enjoy it. The recipe for this low carb and coconut porridge is simple in both its ingredients and procedure. Coconut flour and flax combine with an egg to produce a hot cereal that resembles cream of wheat in texture with a mild coconut flavor. I enjoy it with brown sugar substitute (Sukrin Gold), butter and cream, but to make this Paleo use coconut sugar, honey or maple sugar. Garnish with any topping; an egg, fruit, nuts, honey – just make sure to calculate the carbs. It is full of fiber and moderate in protein. I think it’s perfect with a cup of coffee and a piece or two of bacon! Would you rather have a simple quiche for breakfast? Try the Spinach Bacon Onion Quiche or the Spinach Feta Quiche Muffins – they’re crustless. For an Almond Flour Porridge try this one. 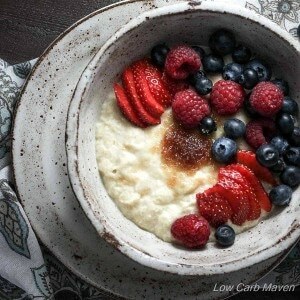 This Low Carb Coconut Flour Porridge Breakfast Porridge is 4 net carbs per serving. A simple warming coconut flour porridge for quiet mornings. This low carb breakfast cereal comes together in minutes providing a fast ketogenic, grain-free breakfast option. Measure the first four ingredients into a small pot over medium heat and stir. When it begins to simmer, turn it down to medium-low and whisk until it begins to thicken. Remove the coconut flour porridge from heat and add the beaten egg, a half at a time, while whisking continuously. Place back on the heat and continue to whisk until the porridge thickens. Remove from the heat and continue to whisk for about 30 seconds before adding the butter, cream and sweetener. Recipe is great, but the nutrition info is way off. I calculate this at ~350 carbs. Tried making this without the flaxseed and maybe i didnt do it right but i cannot eat it. just tastes like powdery eggflavoured coconut mulch. I’m not gonna lie, I was scared to eat this. But what an awesomely pleasant surprise. I miss oatmeal and cream of wheat. And I’m tired of eggs. So I was desperately searching for something, anything. I agree with others, it’s cream of wheat like in texture. I added cinnamon and vanilla like some others. I used Lakanto golden monkfruit. I used regular flax because I had that and assumed it was just a color issue. I ate half a serving and was very full. This is going into the rotation. I’m saving the other half for tomorrow to see how it reheats. What a bizarre concoction, you are brilliant. I love, LOVE this recipe ! I used 4 T of coconut flour as I didn’t have flax seeds and added cinnamon instead of the sweetner ! I am on keto and was getting a little sick of eating eggs all the time for breakfast so I wanna thank you for the recipe ! I’m definitely going to try this. The one thing I miss about my old diet is oatmeal. Anything that comes close would be great! Thank you! I was skeptical about how this recipe would turn out, but I’m happy to say I really liked it! I am starting to get sick of bacon and eggs so this will be a nice addition to my rotation. Thank you for a great recipe! I made this for the first time in the summer and tbh I couldn’t finish it, after eating maybe not even the half of it it made me kinda sick. Maybe I wasn’t used to texture, I don’t know. But some time after that I somehow felt like eating it again. And now I make it reguraly for breakfast, one or two times a week I would say. It’s fairly easy to make and it really is tasty. I can’t compare it to normal porrige tho since I don’t think I have ever eaten one, at least I don’t recall. I omit heavy cream, add more butter and cinammon. Today I tried adding cocoa powder and it was good too. Thanks for the recipe! I omited the egg and added 1/4 c. of pumpkin puree and pie spice, and it’s so good! My eggs scrambled when I added it back to the heat. Maybe I cooked the coconut and flax down too long? My texture’s more like a lumpy soft scramble in heavy cream. That’s not right, right? 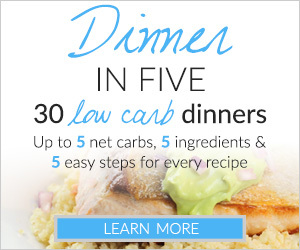 My boyfriend and I loved Malt o meal before starting keto and we were dying to find a recipe to make up for it… this totally hit the spot and filled that void in our life! This recipe is AMAZING!!! Thank you so so much! I added a little more butter because we’re extra like that! So delicious! So good! I love cream of wheat and this is a great keto sub. 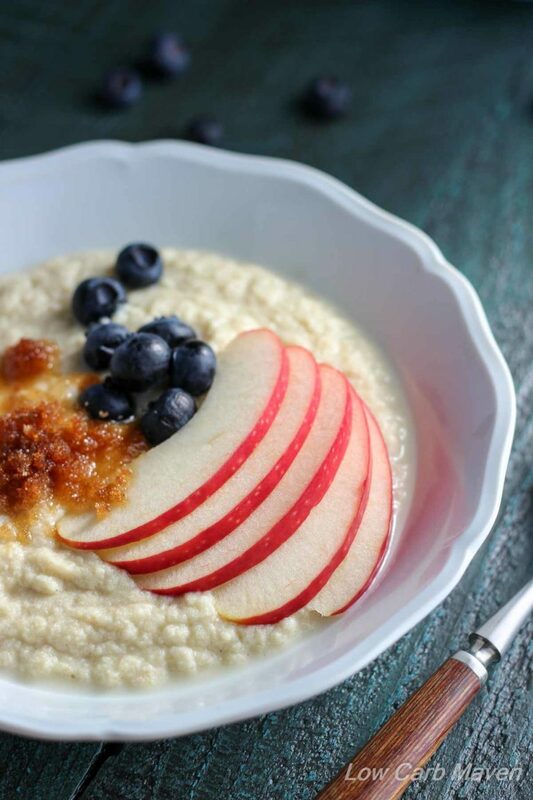 Thankyou so much for this delicious porridge recipe! I so missed porridge when I went a Keto and was sceptical as to how this would turn out but I was so happy at how good it is! Can this be made ahead of time and either reheated or eaten cold? I really want to try it but I have no time in the mornings! You can make it ahead…I’m a meal prepper and I make a big batch and portion it out for the week. How many cups does 1 serving yield? I just wanted to thank you for such a great recipe. This is the third low carb oatmeal/porridge recipe I’ve tried, and I can stop looking now. This will be my go-to from now on. It’s wonderfil both as a sweet option as written or as a savory dish topped with a fried egg. My non low carb eating husband also thought it was delicious! This is a great substitution for keto peeps missing oatmeal, malt o meal, and other porridge type breakfast options. I added sea salted Carmel syrup (skinny no sugar) and it tastes amazing. I added some sugar free maple syrup and less then a tbsp of brown sugar (1tbsp unpacked brown sugar is 2.9 carbs) to the mix and once I put it in my bowl I added it’s a sprinkle of brown sugar and some milk on top…. it’s just as good as regular oatmeal!!! Wow! 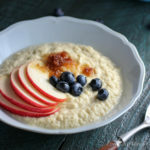 I have not had cream of wheat in over a decade but this is very similar and very easy!!!! I skipped the butter, and coconut milk for cows milk, raisins, walnuts, and coconut flakes. I am stuffing my face right now and having blast doing it. The best part is that it is a meat free, low carb, gluten free breakfast, and thos are hard to come by for me. Way. To. Go! I love this blog! I was inspired by your recipe. 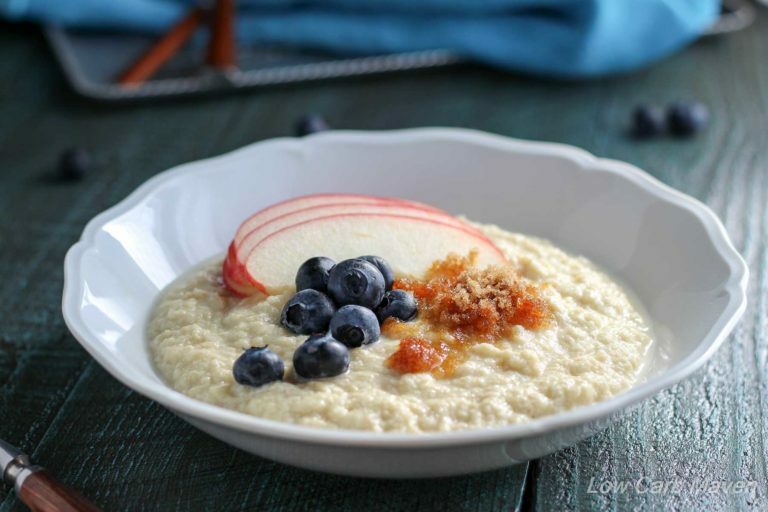 I’m a big fan of porridge and this recipe is a must try for me! I have had this about 4 times now and today I added a tablespoon of chia seeds, a tablespoon of cocoa powder and a tablespoon of psyllium husk powder to it and used almond milk as the liquid. Tasted kind of like Almond Joy candy without all the super sweetness of you know what mean. 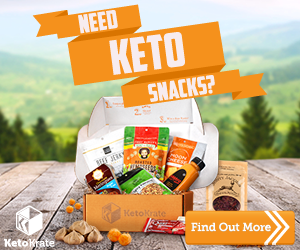 The added fiber kick helps with some of the side affects of the Keto diet. HEY, this is wonderful. It’s reminiscent of a cross between Cream of Wheat and Wheatena. 1) Microwave shortcut: Start by melting the butter, then whisk in the the dry ingredients followed by the wet ingredients (water last) ONLY 1/2 cup of water. MW on high a minute, then whisk, nuke it another minute on high/whisk, then nuke it 30 sec x 2 (3 mins total). 2) I riffed on this to make some savory mock “cheese grits”: leave out the salt and sweetener. After following the microwave instructions above, I stirred in about 2-3 chopped up Baby Bell mini goudas and then S&P to taste. OMG: I’m going to serve this with some oven roasted garlicky shrimp. (or with fried eggs/bacon for breakfast). DECADENT! I’m looking forward also to trying different cheeses. How many servings does this recipe make. I’m counting macros. I doubled the recipe and it didn’t seem thicken up like it did the first time. So I need to add more coconut flour? Thanks! Can you make this ahead & take to work the next day? Would it be a good recipe for that? I’m looking for recipes to be able to take to work the following day. Just made this for breakfast….WOW!! It is just like Cream of Wheat. A definite keeper for those days I just cant face another scrambled egg. This really hit the spot when I was missing my morning oatmeal. I added a little cinnamon and it was pure deliciousness! I won’t lie, I was skeptical. I’ve been burned too many times by substitute recipes. But this was AWESOME. I hate egg whites so I only mixed in the yolk and it still thickened nicely. What was most surprising is how it has the mouthfeel of cream of wheat. If you fed me this and told me it was cream of wheat with a little coconut milk I would totally believe you! Great job! How much (one cup?) does this recipe make? I’d like to make it for my family and don’t know whether to double or triple it. My partner goes to work very early in the morning. Can this be pre made? Thank you! I am so happy to have found you and your site, love your pumpkin porridge. Wanted to try something different but we’re just starting to build our keto cabinet. Alas no Coconut flour yet. Anything I could substitute like almond flour. Can l use a substitute for flax meal? Any suggestions? Can’t by flax meal in my country. Thank you so much for this! It’s the closest keto recipe I’ve found to Cream of Wheat. Thank you Danielle P. for the microwave version–worked perfectly for me! This was so delicious! It turned out really fluffy – which I LOVE. :) I love how you added the egg to it – extra protein and better texture! Will definitely do this one again. I LOVE the HIS LOW CARB COCONUT FLOUR PORRIDGE BREAKFAST PORRIDGE. The texture hit the spot that I was looking for. I microwaved it for 30 sec at time and when it was to my liking I added cinnamon and a little almond milk. It was amazing and I will make it again. 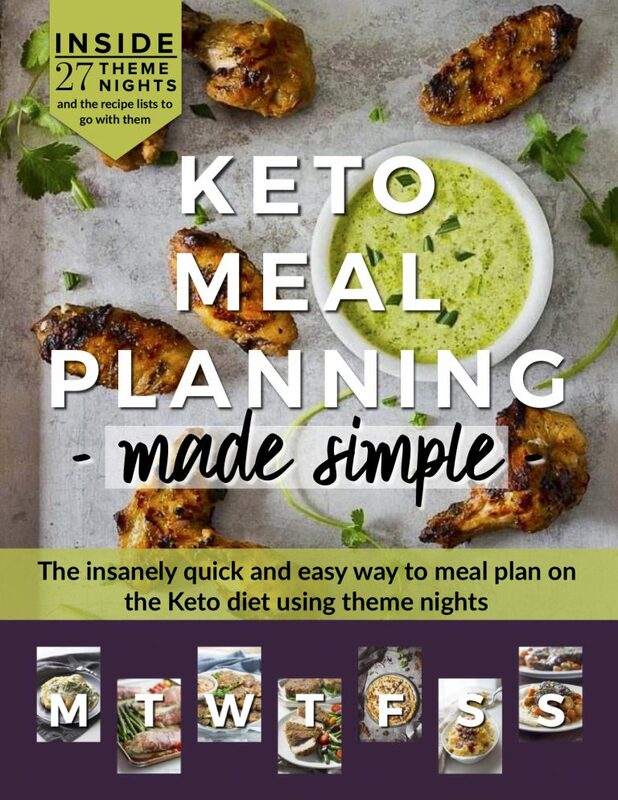 Thank you so much for the recipe I am pretty new to the keto way of eating and this was very helpful. Absolutely wonderful for cold mornings such as today! Will be a recipe to keep with my keto lifestyle. Tried this for the first time this morning, and what a delightful breakfast it was, sprinkled with cinnamon. I wish I’d found this recipe sooner, hot porridge for breakfast in the winter was my number one choice. Amazing!!!! So creamy and tastes like cream of wheat but better!!! I’ve been enjoying this recipe for about 4 months now. I love how flexible it is. This morning I had it with low-carb maple syrup, other mornings I put frozen fruit on it during the 30 seconds of cooking. Sometimes with almond milk, sometimes with cream, sometimes with no additional liquid at all. I have found little difference between using golden vs regular flax, and I kind of like the coloring with the regular flax. Making it in the microwave is easier for me most of the time. I am considering making some and forming it into a loaf, then refrigerating it. After it’s cooled, cut it into slices and fry it like polenta. I miss polenta. Maybe toss in a little corn flavoring. Might need to add a touch more coconut flour for stiffness. I found butter popcorn flavored oil from LorAnn Oils. It’s a tiny tiny bottle, I guess used for frosting and candy flavorings. LorAnn says their oils are carb free. I’ve used lots of different oils for water and smoothie flavorings, but I saw your polenta comment and remembered my buttered popcorn oil (which I’ve yet to use) . I bought it at my local bulk food shop, but I’ve seen them on Amazon and at my big box grocery store in the pro baking aisle. I made this today on one of the first genuinely cold mornings we’ve had so far this year. This is delicious. Before going LC two years ago, I was a huge fan of oatmeal. Your recipe is the best replacement I have tried. Loved the texture, flavor, ease of prep, everything. Topped with a small amount of chopped apple and some cinnamon. Thanks very much, Kim. PS I know you are in California. Hope you and your family are not directly affected by all these fires. Stay safe. I stumbled on this recipe this morning and I’m so glad I did! I wanted something other than just eggs for breakfast…love eating LCHF but get bored with breakfast. I made this for myself and my 3 yr old had to taste it and almost ate my whole bowl lol! So I made more for him and my daughter…they couldn’t get enough! This recipe is fantastic! I had surprising success swapping out coconut flour for hazelnut. Added cocoa powder for a Nutella like treat. This Coconut Flour Porridge is the BEST hot cereal replacement I have tried. So delicious and filling! I used coconut oil instead of butter, added a bit of pure vanilla extract, and 1 TBS of Maple Grove Farms Cozy Cottage Sugar-free syrup. It was perfect! I topped it with a small handful of crushed Dang Cocount Chips. Thank you for posting this! Yum! Second time I’ve made this. I’m still surprised at how filling it is. Instead of fruit my go to toppings are sf choc chips, sf coconut flakes, and sliced almonds. My own little almond joy for breakfast! I…I am shocked. This was amazing. Just like the texture of Cream of Wheat/Rice! I used Silk coconut milk instead of water and added some LorAnn pumpkin spice emulsion and a few drops of her maple and buttered popcorn concentrate drops. I can’t even describe the warm, delicious flavor, it’s just THAT GOOD. Plus, it was so simple to make. I’m going to be using this recipe forever! Could you double the coconut flour if you dont have flax seed meal? This is really delicious when cooled in the fridge overnight. That. Was. So. Good!! It was exactly what I wanted!! Made this, but exchanged thecwarer with almond milk ( you could prob use coconut milk too). Also added a tsp of vanilla, used a tsp butter instead of 2 tsp, to get more fat, & sprinkled cinnamon on top. Super yummy & easy to make. My favorite hot cereal was Instant Cream of Wheat (which has this same kind of mouthfeel) and this is a perfect replacement. I like to add a little maple syrup, some cinnamon and some raisins. DELICIOUS! I quadruple the recipe and put the plain leftovers, covered, in the fridge. It is just as good (if not a little better) reheated and I can change up the toppings. How did you get that calorie count? 2tbs butter is >200kcal, and an egg is 70. Each tbs of flax is at least 50-60calories each? I was a little skeptical about this recipe, but I tried it because of the good reviews. It was so good! As others said, it had a great “cream of wheat” texture and tasted good! I added vanilla extract and topped with SF syrup. Will be making it often…yum! Thank you!! Can you make this without eggs as I won’t touch eggs with a 12ft pole? better you might want to try chickpea liquid. It’s a great sub for eggs when texture is needed. When I make humus I pour the liquid in a baggie and freeze it. About 2 tablespoons per egg. Hi, I am on the SCDdiet which does not allow Flax meal to be used. Did anyone try substituting it in this recipe with success? I am very keen to try and make this…. I cannot stand flax seed so I just made this recipe with 2 TBS of Almond Meal instead… I actually put a little butter in the pan and added Almond Meal to toast it a bit (accent the flavor)then followed the rest of the recipe as it was. It added a few extra carbs (made it about 7 carbs for the serving) but for me it was totally worth it. Sooo yummy! Made this with unsweetened vanilla almond milk and added raspberries. Didn’t require any sweetener as a result. Delicious! I love this, when I make it I just mix it all together and cook. Do you think I could substitute almond flour for coconut flour? Hi, can we make this ahead and reheat in the morning? I would love this for brekky but leave for work at 6 and eat at work around 8:30. Stupid question time….do you use salted or unsalted butter? I used Bobs Coconut Flour and regular groundvflax, as we don’t have golden flax where I live in Canada. Hi JD. I think your porridge was too hot and the egg scrambled or maybe your coconut “flour” was just ground coconut?. I will tweak the instructions. The color of the ground flax will not affect the recipe except make it darker. A finer milled flax may work better than a coarse milled flax, however. This is amazing! I have successfully made it without the egg as well (I was out), and it’s very tasty that way, too. This is awesome, I added some cinnamon and used half water and heavy cream. I will be making this a lot! I had to try this and it is GOOD! i did use a little less flax and a tsp. Of china seeds. And this seemingly small amount made enough for two breakfast sides for me- I stored half in a glass Pyrex container and tomorrow and am going to reheat it with a tsp. Of chocolate protein powder- like chocolate Malt-o-meal! I think to make the process a bit quicker I will mix together the proper proportions of dry ingredients by 4 in a container so all I have to do is scoop 4 tblspns into the pot when I want to make a full recipe. Really hit the spot! Thank you so much! Chia not china. I really do not like autocorrect. Haha! I knew what you meant and I feel the same! ? Delicious! I subbed coconut oil for the butter and it worked well. Just made this and it is delicious!!!! Thank you so much, I’ve missed having something like this for breakfast! Sounds lovely. Could you use psyllium husks instead of the golden flax meal? Made this this morning. Lovely. I tried the vanilla idea. Think I need to add a little more. I needed much more water than suggested. It was already solid before I started heating. Suspect my tablespoons are a little large! Made this for breakfast this AM. Sweetened with SF maple syrup and added fresh blueberries. It was fantastic!!! I remember when breakfast was a challenge when eating low carb…thanks to creative people like you there are so many wonderful choices for breakfast these days. Thank you! Just tried to hit the 5 stars symbols, when my dog nudged my hand and posted instead. So here’s my 5 stars! Finally tried this after having it on my to-do list for awhile. OMG, Kim, it is fantastic! First bite I was seeing if it did taste like cream of wheat. Not really, although the texture is similar. Then, another bite. Getting used to the flavor which isn’t like anything I’ve ever had before. Third bite and it’s becoming addictive all on its own! Love this and will definitely be making this frequently! So filling, and it is a big bowl of awesomeness! I sprinkled a little fresh grated nutmeg on it. Oh, ditch the sweetener and use parmesan and it could be like risotto! A real winner, Kim! 5 stars! Just had to let you know how much we enjoyed this for breakfast. DH turned his nose up while I cooked it, then asked for seconds. Added a touch of vanilla and it DOES taste like cream of wheat! Thanks for the recipe! This is delicious! It doesn’t taste like Cream of Wheat, but the texture is there, and it’s a really good flavor! I love it! It’s going to be great on those cold Minnesota winter mornings. Thanks for coming up with this! I was wondering if I I can make this ahead of time. I have time to put breakfast together, but no time to eat it.. If I make it, and then take it to work, and then reheat it, would that be okay, or is it going to ruin it? Mary. You can try. Also, this recipe can be cooked in the microwave so I would mix all of the ingredients together (I wouldn’t do it overnight), then cook at work in a microwave at 30 second intervals, stirring in between each interval until it’s done. You may need to add more water because the coconut flour and flax may absorb it. Let me know if this works for you. I wasn’t sure I liked the sound of whisking in an egg (I would never have put one in porridge) and the consistency freaked me out a bit whilst cooking but I loved it! Great creamy consistency, subtle flavours and very filling. Perfect for a chilly English morning. Wow, thank you for this amazing recipe! I don´t have flaxmeal, so I substituted it with one tbsp almond meal and one tbsp chia seeds. I am a biiig chocolate fan, so I planned to put cocoa in the porrige. But when I tasted it, it was sooo good, that I did not want to cover this flavour with cocoa. I just put a little bit of cinnamon in, and now I am having the most amazing breakfeast! Thank you! Oh My Lord!!!! This gives me the exact mouth feel of Cream of Wheat!!! The taste is surprisingly close too!!! I will add a few toasted nuts next time. I didn’t get even a hint of coconut flavor. 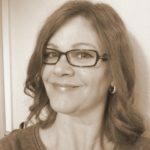 Thank you for the perfect food memory that is low carb!!! I would NEVER have thought to cook some coconut flour and flax meal to make porridge. This was good and easy to make. Perfect for keto! I’m new this sounds good. I came across this last weekend and have had it a couple times this week. I have tried similar recipes and they just did not hit the spot like this one! Very good! Thanks for sharing. I’ve made this twice and love it. The only downfall is later in the day I get a burning in my gut. It last all day. I’m not allergic to anything. Can you think of anything I might be doing wrong. I don’t want to stop eating it. I just want to say that I saw this recipe posted on facebook three days ago. I’ve made it twice for breakfast since then and I absolutely love it. I grew up eating malt-o-meail and cream of wheat and this tastes just like it. Well done! I’ve reposted it and recommended it to all of my friends who grew up eating similar foods. Made this a few times now. It’s yummy! Made this this morning and hubby thought it was amazing!! Yours in the picture looks like it’s a little liquidy. Did you add something after just for that picture? My is a little thick but I still love it. Perhaps it’s because I used canned coconut milk? I used to love cream of wheat as kid. I’m thinking I may have stirred it too long or it’s because of the canned milk. Also, can this be doubled or will it mess up cooking times? Thanks. Made this a few times now. It’s yummy! I’ve also doubled it and microwaved the leftovers at work with no problems. Can I use ground flaxseed? That’s all I have but I don’t think it’s golden. Could you make a huge batch of this then microwave the left overs for a quick breakfast? Amazingly good and the same texture as Cream of Wheat! I ground my flax seeds, 2 T. (regular, not golden)- had to add a bit more water-excellent! Thank you! We don’t eat flax, is there something it could be subbed with? Kim! I’ve been making this every morning for the past week! I’m totally in love with it. Thanks for much for the awesome idea! can we leave the egg out if we are allergic to it? I’ve tried using flax meal a couple of times in baking, and no matter what, I can’t get used to it! The flavor is very off-putting to me. Is there anything that could replace it in this recipe, or is it necessary for the texture? Hi Chloe. First, just so other people know, there is regular flax which is very dark and strong tasting and then there is golden flax which is lighter in color and flavor – almost a bit nutty. But, I totally hear you. I don’t like the Bob’s Red Mill GF baking mix because there is white bean flour in it and it tastes like raw bean. No matter how I use it, that is the predominant taste to me. My daughter can’t taste it, so I understand where you are coming from. But thank you in advance for the recipe! I love my low-carb lifestyle and I don’t think I’ll ever go back, but I sure do miss my warm bowl of oatmeal in the morning. I used almond meal in place of the golden flax meal and while I don’t think it thickened as much as it probably should have, it was still very tasty! Made this today and it was great! I added a little SF maple syrup on top-yum! Will definitely be making again, it’s great to have an option for a hot “cereal”. Thanks for the great recipe! Made it on this 15° morning. It hit the spot. Four hours later and I’m still quite full. Thank you! Cream of Wheat was a favorite of mine growing up! Just tried this and its amazing!!! I added a little vanilla and it absolutely brought wonderful childhood memories back. Thank you! This looks great! I am new to your site and I am glad I found it.